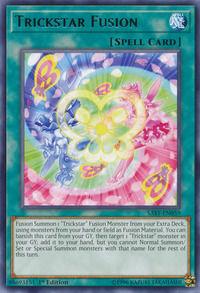 Fusion Summon 1 "Trickstar" Fusion Monster from your Extra Deck, using monsters from your hand or field as Fusion Material. You can banish this card from your GY, then target 1 “Trickstar” monster in your GY; add it to your hand, but you cannot Normal Summon/Set or Special Summon monsters with that name for the rest of this turn. Trickstar Nightshade and one unknown Trickstar monster appears in this card's artwork.